The very spot of the cheek is very sweet, intensely flavoursome meat, and is used in braising. The whole neck end is taken from the spare rib and blade joined together. This can be butchered to produce two separate cuts, or boned and rolled together to produce a roasting joint. Separately, the Spare rib can be cut into chops, not to be confused with chinese style spare ribs. The chops have more internal fat which produces a sweet, tender chop. The blade is traditionally a cheaper-end roasting joint, and we also use boned blade for diced pork. This is an old-style roasting joint. The front leg has a lot more bone-to-meat ratio than the back leg. To produce a 'Hand' ready to roast, the trotter is removed, along with all of the internal bones, this is then tied to produce a boneless joint. Today the haunch is also used for diced pork, and very popularly for sausages. The belly is a flexible part of the pig with several options of use. The belly can be left whole, with the skin scored and then roasted whole. The whole belly can be cut into belly strips - these are great used as chops, or marinated for a barbecue. The ribs can also be removed in one sheet and cut into individual bones for chinese style belly ribs. Any waste from the belly is ideal meat for sausages. The leg can be roasted either whole or boned first and then split in half as a boneless roast. Can also be broken down into single muscles, to use for pork escalopes or cut for pork stroganoff. Trotters are used in making stocks, once split in half. This is due to their high gelatine content. 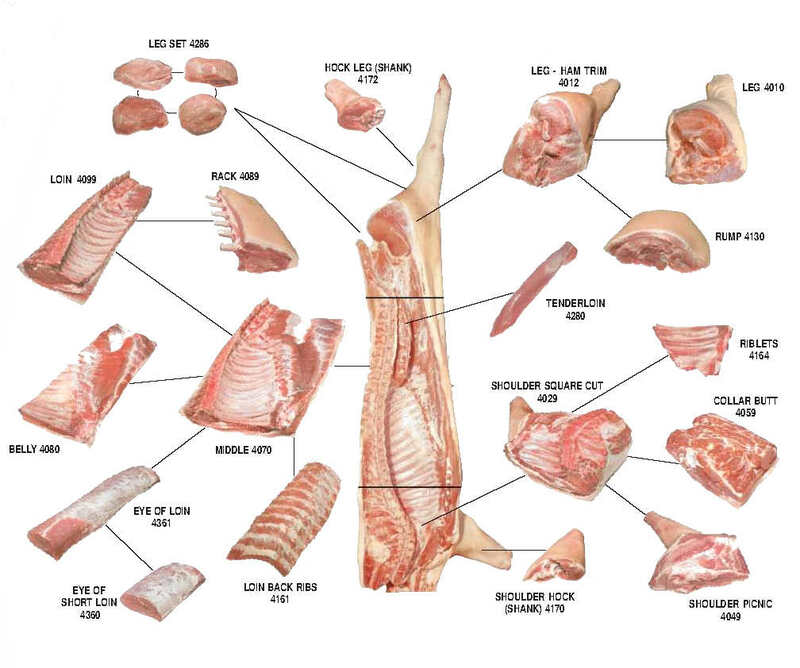 Can be used for stocks and sauces, but hind trotters are served boned and stuffed in high end restaurants.